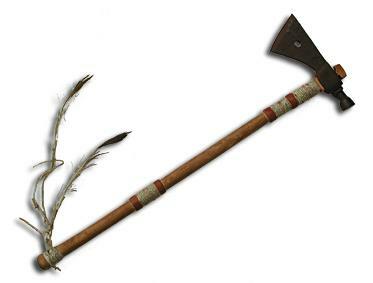 So you're driving along in your patrol car at the end of a long day when you notice a gentleman out on the lawn holding a tomahawk over his head. Upon further observation, you notice another gentleman on a nearby veranda, this one holding a speargun and a bow-saw, with two axes nearby. Even in Australia, this is probable cause to stop and inquire. Police in Grafton, New South Wales, encountered this tableau in March and ultimately arrested both men (who were neighbors). Witnesses described an ugly yet hilarious incident that apparently began when one neighbor approached the other (the one on the veranda, hereinafter "Roger") and began arguing with him about something. The argument escalated, and Roger then "went inside his home but came back out moments later brandishing a loaded speargun in one hand and an axe in the other." The neighbor then "backed down the stairs," which is not a bad plan if somebody confronts you with a loaded speargun, although turning and running might be better. He was "about four meters away" when Roger fired the speargun, but luckily the spear missed. I've never actually fired a speargun, but it seems like either Roger intended to miss or is a lousy shot, given that my research reveals that "four meters" is only about 13 feet. The problem with missing a speargun shot, though, is that the spear has a rope attached to it, so the intended victim (if human) could grab the rope and pull you toward him, which this one did. The report then gets a little confused. It says "he" then grabbed an "axe" and tried to cut the rope, but this presumably refers to the neighbor and his tomahawk because Roger could have just dropped the speargun if he didn't want to be hauled in. (Note that this would mean the neighbor already had the tomahawk with him when he came over in the first place, which isn't very neighborly.) Roger then went back inside, saying he was going to get "something bigger and better." He didn't, though, instead coming out with another axe and a bow-saw, neither of which beats the loaded speargun he started out with. not an bow that shoots saws (although that would be awesome), so it's not clear how this helped. Although I guess it probably looks scary if somebody's waving it at you. The police seem to have happened along at this point. But according to them, when they got there they saw Roger "holding a speargun and a bow-saw with two axes nearby." That would mean that Roger had put down both axes in favor of an unloaded speargun and a woodworking tool, a poor decision when facing somebody with a tomahawk. If so, maybe it's a good thing for Roger that the cops came along when they did. Well, we may never know the truth, but we do know that Roger was convicted of "firing a spear gun in a manner likely to injure a person or property" and got nine months in jail. His neighbor was also charged with unknown tomahawk-related offenses, but those charges have not yet been resolved. 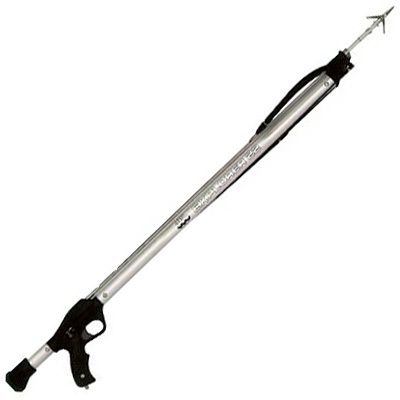 This is the first item I've covered that involved either a tomahawk or a speargun, although there was the New Zealand case involving a trident. Personally, I think "never steal from a guy with a trident" is still excellent advice. Link: Clarence Valley Daily Examiner via Dave Barry.